DIRKSEN, Everett McKinley, (father–in–law of Howard Baker), a Representative and a Senator from Illinois; born in Pekin, Tazewell County, Ill., January 4, 1896; attended public schools and the University of Minnesota College of Law at Minneapolis; during the First World War served overseas as a private and later as a second lieutenant of Field Artillery 1918-1919; general manager of a dredging company 1922-1925; commissioner of finance of Pekin, Ill., 1927-1931; studied law; admitted to the bar in 1936 and commenced practice in Pekin, Ill.; elected as a Republican to the Seventy-third and to the seven succeeding Congresses (March 4, 1933-January 3, 1949); chairman, Committee on District of Columbia (Eightieth Congress); was not a candidate for renomination in 1948; elected as a Republican to the United States Senate in 1950; reelected in 1956, 1962, and again in 1968, and served from January 3, 1951, until his death in Washington, D.C., September 7, 1969; Republican whip 1957-1959; minority leader 1959-1969; chairman, Joint Committee on Inaugural Arrangements (Ninetieth Congress); lay in state in the Rotunda of the U.S. Capitol, September 9-10, 1969; interment in Glendale Memorial Gardens, Pekin, Ill.
Papers: Letters and documents relating to Dirksen's demand for Alschuler's impeachment for partiality in a patent case in Samuel Alschuler papers, 1885-1969. Papers: 4 audiotapes (1965-1967) in Westinghouse Broadcasting Company collection, 1945-1981. Papers: 57 items (1937-1961) in Sterling Morton papers, 1885-1961. Personal correspondence. Finding aid. Papers: 2 letters (April 27, 1954; June 7, 1955) in the V.K. Wellington Koo collection. Official correspondence. Finding aid. Papers: Ca. 1900-1970. 1,800 feet. Personal, business, and congressional papers and correspondence, including 200-page memoir (1896-1950), photographs, portraits, motion picture film (including Your Senator Reports), sound recordings, and memorabilia. Finding aid. Restricted. Oral History: Discussed in interviews with Glee and John Gomien, executive secretary and administrative assistant, respectively (July 23, 1980), 43 and 42 pages; and with Roman L. Hruska (January 5 and April 22, 1981), 240 minutes. Papers: Correspondence in Maurice du Pont Lee papers, 1900-1973; and Jasper E. Crane papers, 1893-1970 (bulk 1926-1969). Papers: Correspondence in Robert A. Taft papers, (1885-1962). Oral History: May 8, 1968; March 21, 1969; July 30, 1969. 13 pages, 15 pages, and 8 pages. Oral History: 1966. 12 pages. Papers: In Edith Nourse Rogers papers, 1881-1960; and Emma Guffey Miller papers, 1887-1970 (bulk 1920-1970). Papers: In Alexander Wiley papers, 1913-1967; and Republican Party of Wisconsin records 1938-1988. Papers: Correspondence in Stella Brunt Osborn papers, 1916-1983; Louis Carlisle Walker papers, 1881-1963; Elly Peterson papers, 1943-1985; John Butlin Martin papers, 1948-1965; George Francis Lemble papers, 1958-1968; George Wilcken Romney papers, 1939-1973; and Owen J. Cleary papers, 1944-1959. Finding aid. Papers: Correspondence in Felix Edgar Wormser papers, 1940-1965. Finding aid. Papers: Correspondence in Harold Phelps Stokes papers, 1908-1969; Ogden Rogers Reid papers, 1925-1982; and George Howard Edward Smith papers, 1917-1962. Research Libraries Information Network In addition to the institutions listed above, items are also cataloged in collections at: St. John's University, Jamaica, NY; Stanford University Libraries, Stanford, CA; University of Illinois, Urbana, IL; University of Iowa Libraries, Iowa City, IA; University of Michigan, Rare Books, Ann Arbor, MI; University of Minnesota, Immigration History Research Center, St. Paul, MN; and Wayne State University, Walter P. Reuther Library, Detroit, MI. Bauer, Fred, ed. Ev: The Man and His Words. Old Tappan, NJ: Hewitt House, 1969. Cronin, Jean Torcom. "Minority Leadership in the United States Senate: The Role and Style of Everett Dirksen." Ph.D. dissertation, Johns Hopkins University, 1973. Deason, Brian. "Scott Lucas, Everett Dirksen, and the 1950 Senate Election in Illinois." Journal of the Illinois State Historical Society 95 (Spring 2002): 33-51. Dirksen, Everett M. "Big Government--The Road to Tyranny." American Economic Security 10 (May-July 1953): 9-17. Dirksen, Everett M. The Education of a Senator. Urbana: University of Illinois Press, 1998. Dirksen, Louella, with Norma Lee Browning. The Honorable Mr. Marigold: My Life with Everett Dirksen. Garden City, NY: Doubleday Co., 1972. Fonsino, Frank J. "Everett McKinley Dirksen: The Roots of an American Statesman." Journal of the Illinois State Historical Society 76 (Spring 1983): 17-34. Hulsey, Byron C. "Himself First, His Party Second, Lyndon Johnson Third: Everett Dirksen and the Vietnam War, 1967." Congress The Presidency 22 (Fall 1995): 167-81. ___. Everett Dirksen and His Presidents: How a Senate Giant Shaped American Politics. Lawrence: University Press of Kansas, 2001. ___. "'He is my President': Everett Dirksen, John Kennedy, and the Politics of Consensus." Journal of Illinois History 2 (Autumn 1999): 183-204. Keynes, Edward. "The Dirksen Amendment: A Study of Legislative Strategy, Tactics and Public Policy." Ph.D. dissertation, University of Wisconsin, 1967. Kyvig, David E. "Everett Dirksen's Constitutional Crusades." Journal of the Illinois State Historical Society 95:1 (2002): 68-85. Loomis, Burdett. "Everett M. Dirksen: The Consummate Minority Leader." In First Among Equals: Outstanding Senate Leaders of the Twentieth Century, edited by Richard A. Baker and Roger H. Davidson, pp. 236-63. Washington: Congressional Quarterly, 1991. MacNeil, Neil. Dirksen: Portrait of a Public Man. New York: World Publishing Co., 1970. Penney, Annette Culler. The Golden Voice of the Senate. Washington: Acropolis Books, 1968. Rosenberger, Francis Coleman. "Washington's Jim Berryman, 1902-1971: Cartoons of Senator Dirksen." In Records of the Columbia Historical Society of Washington, D.C., 1971-1972, vol. 48, edited by Francis Coleman Rosenberger, pp. 758-75. Washington: Columbia Historical Society, 1973. Schapsmeier, Edward L. "Dirksen and Douglas of Illinois: The Pragmatist and the Professor as Contemporaries in the United States Senate." Illinois Historical Journal 83 (Summer 1990): 75-84. Schapsmeier, Edward L., and Frederick H. Schapsmeier. Dirksen of Illinois: Senatorial Statesman. Urbana: University of Illinois Press, 1985. ___. "Everett M. Dirksen of Pekin: Politician Par Excellence." Journal of the Illinois State Historical Society 76 (Spring 1983): 3-16. ___. "Senator Everett M. Dirksen and American Foreign Policy: From Isolationism to Cold War Interventionism." Old Northwest 7 (Winter 1981-1982): 359-72. Torcom, Jean E. "Leadership: The Role and Style of Senator Everett Dirksen." In To Be a Congressman: The Promise and the Power, edited by Sven Groennings and Jonathan P. Hawley, pp. 185-223. Washington: Acropolis Books, 1973. U.S. Congress. 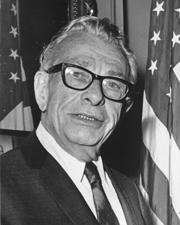 Memorial Services Held in the Senate and the House of Representatives of the United States, Together with Tributes Presented in Eulogy of Everett McKinley Dirksen, Late a Senator from Illinois. 91st Cong., 1st sess., 1969. Washington: Government Printing Office, 1970.